Well even more new goodies I got from Paper Trey Ink. This stamp set is the Tea for Two set plus the wood grain back ground, I have covered a note book this time...I have chosen the colours from Colour Throw down this week. I also love the fact that most of the stamps from PTI have dies to match so more cutting!! yeah - oh no - now what will I do in all that spare time! lol. I have chosen Tangerine Tango (slowly becoming one of my favorites and marine mist which is my all time favorite blue at the moment and I have also used some crumb cake. Off to play some more yeah!! 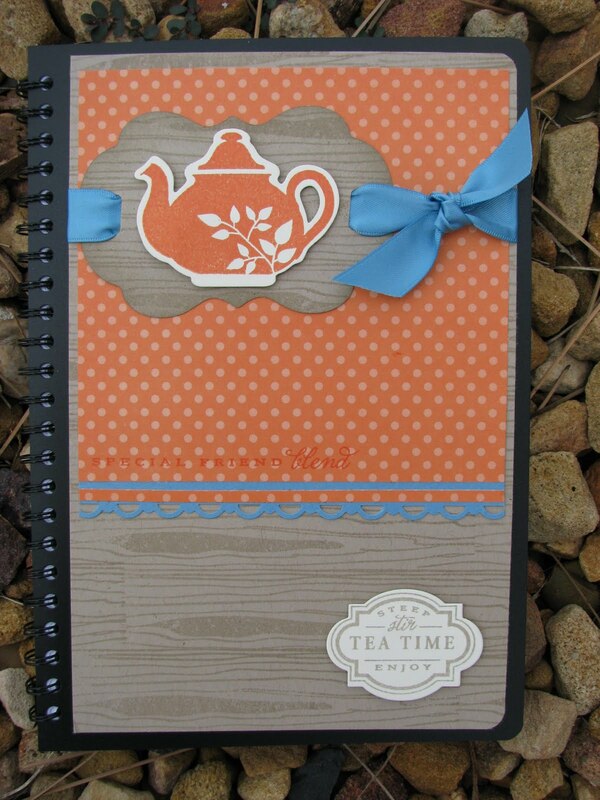 I love the note book & you Gotta love the Teapot & dies actually all the dies. have fun with all your new goodies look forward to seeing more. You ARE having fun with your new loot. I have the Tea for Two set and die - ahem, must dust it off and use it. Can't believe it's taken you so long to get into TTango - I like it more than PPie these days. Love this Tam! That teapot is so sweet and I like the way you did the ribbon! 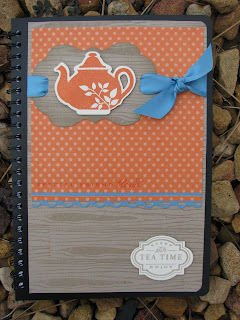 you and your teapots.... this one is really cute, really nice notebook cover. great colours too. What a great notebook cover! Love the woodgrain! And I love having dies to match stamps too!! Thanks for playing the Color Throwdown with us! ooooooooo I spy more PTI goodness here! lol Don't ya just love those little teapots? Look what I got to play with! !